We are managing this site, thinking that it is useful to the international student who learns in Japan. ‘International students Plaza’ locating at the center of this site, can be utilized by exchanging helpful information of financial support and acceptance from various companies as well as Japanese culture and customs. Furthermore, must-see-content ’Plaza for Environmental issues and/or technologies’ are included. How to use those four “Communication Plazas” is explained. Those who post or contribute to various communication Plazas are called like this on this web site. When contributing information, an opinion, and a question along form, it will be published on a site by a handle name. A contributor's contact address and name are not displayed on the communication Plazas. Supporters in various countries who reply to the inquiry or opinion are called like this on this web site. He replies a contributor's information, opinion, and question. The handle name and the first part of three comments that replied speedy are indicated on this web site. The contributor only who contributed to the Plaza can know the contact address and the full contents of the comment person answered to the inquiry. 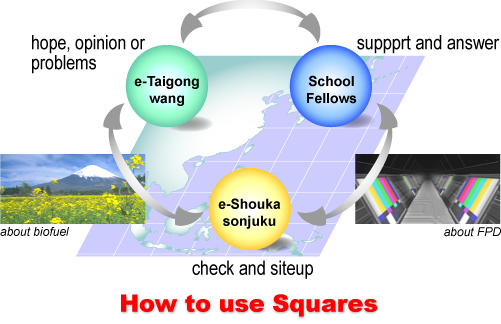 e-Shoukasonjuku is the handle name of the Webmaster. He confirms that the content of the inquiry and it’s answers follow the site rule. He supports e-Taigongwang with School fellows, and exert effort to the problem solving. He manages this site correctly and promotes multi-national exchange and international exchange in the East Asia. The purpose of the Plazas is to disclose the opinion or the problems which international student possesses, and to support him (or her) by colleagues living in many countries by considering privacy. Person name “e-Taigongwang”, same as this site name, is active and ambitious young men, including international student, in the East Asia. He obtains the chance to learn many from others in the East Asia. He can choose whom to contact. Creation of the original networks. Those who answer quicker get the chance to contact to Contributor. The answers of three comment persons will be accepted. Contributor: Please open and write your opinion or the problems in the inquiry (entry) form. Comment person: Please read the “Communication Plaza” by clicking and opening it, write a reply in the answer (comment) form. (1) Use either English or Japanese in participating ‘International students Plaza’. And use only English in participating environmental related Plazas. This site supports the use of the translation software　when you use a certain language. (2) Private information is not displayed in this site, and a handle (nickname) is allowed to be used in the open stage of this Plaza. However the contribution to the Plaza form does not receive anonymity. (3) In the Plaza relevant to environment, comment person are not allowed to respond the contribution when he (or she) has the same nationality. Namely, persons other than Chinese only can answer the question from Shanghai.